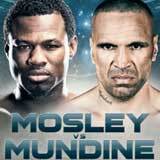 Review: 2013-11-27, disappointing fight between Shane Mosley and Anthony Mundine: it gets two stars. The 42-year-old Shane Mosley (47-8-1, 39 KOs=83%) entered as the No.15 welterweight in the world while Anthony Mundine (44-5-0, 26 KOs) entered as the No.15 light middleweight. Mosley vs Mundine is valid for the vacant WBA International light middleweight title. Watch the video!